Through text and illustrations, Judge puts dinosaur size into context. A Stegosaurus, she notes, weighed about as much as three cows. But those plates on his back made him look a lot bigger. And Microraptor? That little guys was no bigger than a chicken. Leaellynasaura was nearly as tall as your average Emperor penguin and Velociraptor was only the size of a dog. A large dog, mind you. One of the largest dinosaurs, Argentinosaurus, was as long as four school buses and weighed more than a herd of elephants – but most dinosaurs fell somewhat short of that. What I like about this book: It’s fun. 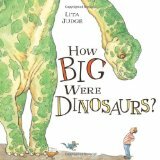 Judge uses size comparisons to relate cool facts about dinosaurs, and combines creative storytelling with her wonderful illustrations to share authentic information about these ancient reptiles. In her illustrations she places dinosaurs next to modern animals (and cars) to give some perspective on relative sizes, and provides a fold-out chart that compares dinosaurs to each other. Judge knows her facts; she spent three summers as a teen, volunteering at dinosaur digs. But she also has fun with her illustrations, imbuing her dinos with great expressions and hints of personality. For example: Torosaurus, with a 10-foot skull, is not the sort of beast you could force into the veterinarian’s clinic. Drop by Archimedes Notebook for some book-related activities. One thing I notice, as the lawn grows wild over the summer: the color palette of the wildflowers changes. A couple weeks ago it was all yellow. 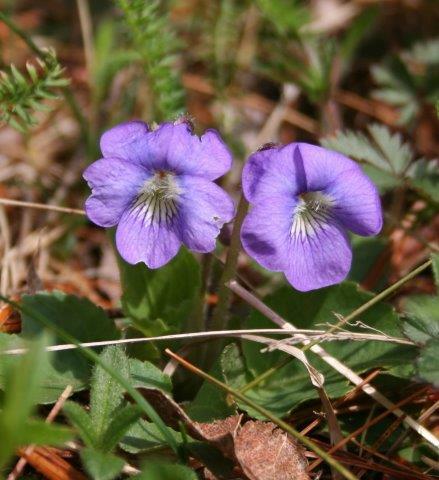 Now as more violets bloom, there are great patches of purple across the lawn. If you’re looking for a hands-on science activity this week, drop by Archimedes Notebook and check out “Colors of the Season“. Children’s nonfiction author Mary Kay Carson has three new books out. Why Does Earth Spin? : And Other Questions about Our Planet, illustrated by Peter Bull, answers many common questions about our planet. How big is the Earth, what is it made of, and why is the sky blue are the types of questions it covers. It is perfect for a unit on Earth science. How Many Planets Circle the Sun? 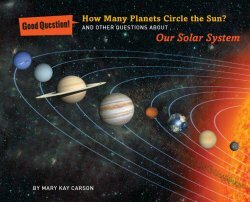 : And Other Questions about Our Solar System, illustrated by Ron Miller has amazing answers to puzzling questions about planets, dwarf planets, and asteroids. Do you know there is a planet that has a storm cloud named Scooter? Read the book to find out which one. At Growing with Science blog where we review these books today, we also have information about the new meteor shower that has been predicted for next Friday, May 23-24. What is amazing is that the meteor shower, if it comes about, will be due to something that happened to a little comet known as Comet 209P/LINEAR way back in the 1800s. How can that be? Carson explains the relationship between comets and meteor showers on page 27 in the book. 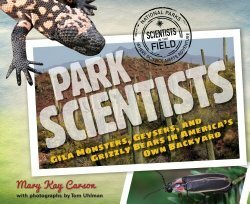 Park Scientists: Gila Monsters, Geysers, and Grizzly Bears in America’s Own Backyard is the newest release in the Scientists in the Field Series. For this book Mary Kay Carson has teamed up with her photographer husband, Tom Uhlman, to explore the science being carried out in our national parks. Conclusion: Because Scientists in the Field has been such a popular and long-running series, it is easy to not pay as much attention to the individual books as they come out. That would be a mistake, because Park Scientists has a lot to offer. The timing of the release is perfect to catch the interest of youngsters who are headed out to take a vacation at a national park this summer. Get this book in their hands and it is likely they will want to do some science, too. See the full review and more information at Wrapped in Foil blog. Categories: STEM Friday round-up | Tags: Earth science, How Many Planets Circle the Sun? 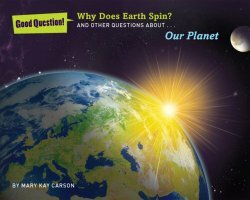 : And Other Questions about Our Solar System, Mary Kay Carson, meteor shower, Park Scientists, Scientists in the Field Series, Why Does Earth Spin? : And Other Questions about Our Planet | Permalink. A honey bee tackles different jobs over her short lifetime: she cleans the hive, babysits larvae, helps build and guard the nest, serves as scout and harvests food. We follow Scout as she picks up scents with her antennae, dodges a hungry blackbird, and finds shelter from a sudden storm. Finally she makes it home and dances her dance to tell her sisters where to find the best nectar and pollen. What I like about this Book: Aside from the marvelous honey-colored cover and those wise bee-eyes staring out at the reader? I love the name “Scout” – it’s perfect for a bee on a reconnaissance mission. I like the “fact notes” tucked into the page: how many bees in a hive, how far a honey bee travels to find honey. 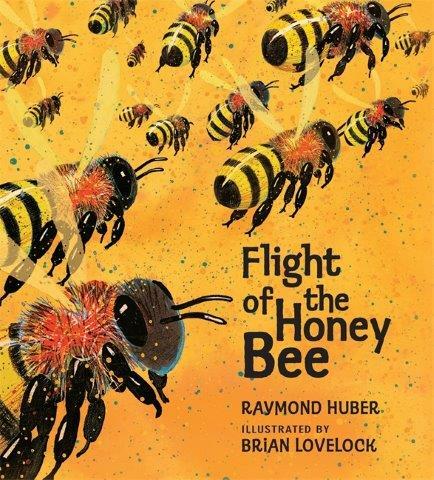 I love the warm, honey-color running through the illustrations, and the splatters of color like bits of pollen that manage to get on every page. There’s great stuff at the back, too – notes on how to “save the bees” and an index for impatient folks who want to quickly flip to the facts. Check out hands-on activities over at Archimedes Notebook. As I mentioned in a previous post here at STEM Friday about discovering STEM poetry books, reading science poetry with children has many benefits. It is an opportunity to introduce the poetry fans to STEM and the STEM fans to poetry. In addition, science poems can be read and enjoyed by children with a range of reading abilities. The use of sensory language and vivid imagery is likely to bring a new depth to scientific concepts. Combining science and poetry is a winning mix. 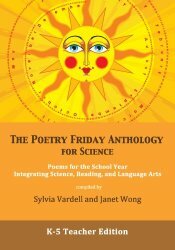 The Poetry Friday Anthology for Science: Poems for the School Year Integrating Science, Reading, and Language Arts by Sylvia Vardell and Janet Wong is a wonderful new resource for educators to share science poetry throughout the year. The K-5 Teacher Edition, shown above, contains 218 science poems by 78 poets, one for each weeks for the 36 weeks of the school year for Kindergarten through 5th Grade. To help extend the poems, every one is accompanied by a 5-step mini-lesson with connections to the new Next Generation Science Standards (NGSS). The poems are also available in grade-specific Student Edition volumes, each containing 36 weeks of science poems (and a few bonus poems) that are nicely illustrated with line drawings. They are just the right size for young children to hold and enjoy. For a more extensive reviews of The Poetry Friday Anthology for Science, see Growing with Science and NC Teacher Stuff. For printables and additional resources, be sure to visit the publisher, Pomelo Books. Categories: STEM Friday round-up | Tags: Janet Wong, science poetry, Sylvia Vardell, The Poetry Friday Anthology for Science | Permalink. What could this mysterious package be? It’s a pupa! And what’s a pupa, you ask? It’s the teenage stage of a moth or butterfly’s life – where they hang around the house and look like they’re doing nothing, but a lot is going on inside. This particular pupa started life as an egg on a butterfly farm in Costa Rica. What’s a butterfly farm? Well, that’s what this book is all about! From the front endpapers to the last page, this book is filled with excellent writing and gorgeous photos. It shows how farmers in Costa Rica raise butterflies for museums around the world. They make sure caterpillars have plenty of food, and they scout for predators that sneak in. When the caterpillars are ready to pupate, the farmers move them into special screened cabinets. I also like the way author Loree Burns explains terminology in easy-to-understand language, and the wealth of information tucked into the back pages. 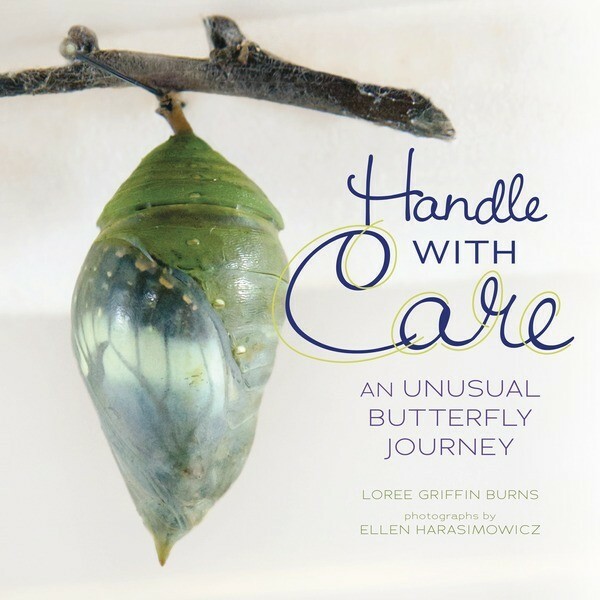 Check out some hands-on butterfly science over at Archimedes Notebook today. What does the word “city” make you think of? Traffic? Museums? Skyscrapers? People? Cities are thriving, vibrant communities that operate on several different levels—literally! Underground, on the ground, and way above ground, city dwellers are busy making their patch of earth as efficient, comfortable, and user-friendly as possible. In Cities: Discover How They Work with 25 Projects, readers delve into all of the great things that make cities the wonderful places we love to both live in and visit. For instance, did you know that streetlights have been around for over 2,000 years? Benjamin Franklin was the first to light the dark streets of the United States. And how do cities handle all of the waste produced by the billions of residents? Wastewater treatment plants are where contaminants get removed before the cleaned water is flushed out to a lake, river, or ocean, or used for irrigation. Cities are marvels of engineering and offer the perfect opportunity for students to flex those STEM muscles. Readers ages 9-12 are asked to figure out methods to provide water to the top floors of sky scrapers, keep cities safe during natural disasters such as earthquakes, and provide a steady supply of energy to inhabitants who live both near and far from power stations. History, science, engineering, architecture, and technology combine in this fascinating book about a subject that billions of people will find familiar but only a handful—such as the kids who read Cities—will be able to explain. Click here to check out a video of the animated growth of Midtown Manhattan! Copyright © 2014 Nomad Press All Rights Reserved.